In this part 2 of my monthly newsletter blog on robots, I’ll mention how our fully employed economy is rapidly accelerating investment in and implementation of a robot workforce. Are We Actually Experiencing an AI Explosion? The world of artificial intelligence is advancing so rapidly and in so many industries, countries, and applications, that to many it feels like the automated evolution is rising exponentially. 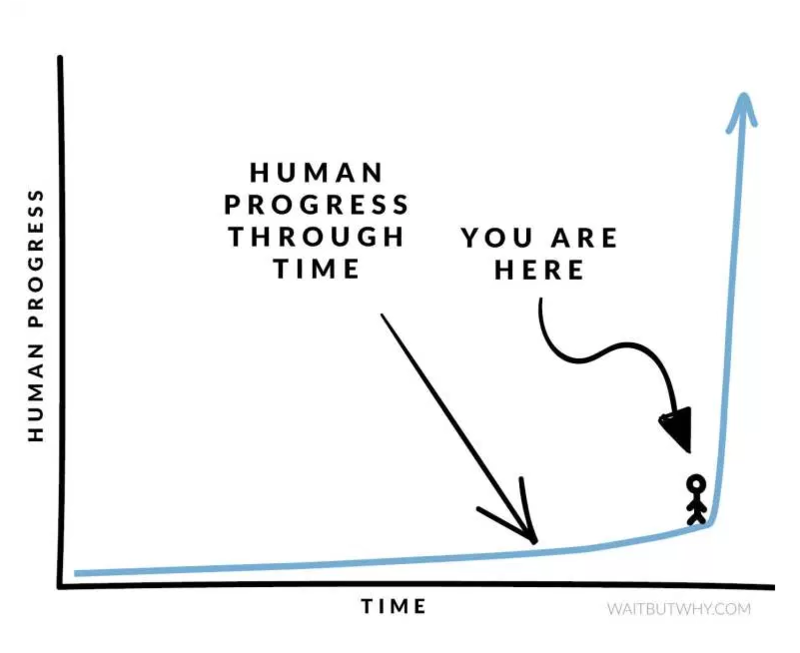 Here is tech writer Tim Urban’s (waitbutwhy.com) illustration of just where we are on the timeline of human progress and the explosion that is allegedly right in front of us. There is this notion that rapid growth in AI (or rather, explosive exponential growth) is here now or just in front of us. Tom Friedman’s best selling book, Thank You for Being Late, also supports this premise. However, I don’t believe we are this far along the S-cure of progress, because implementation of robotic technologies is not evolving at light speed. AI trends such as virtual assistants, smart robots, and human voice adapting are still in their relative infancy and taking more time than initially thought to be really useful. While I think the future is soon, it’s not that soon. Consequently there is time to prepare your company and your workforce for the robot economy. And it’s a good idea to start soon because there is no doubt that the robots are coming. In last month’s newsletter I mentioned a couple of AI applications fully operational now. Aside from Flippy at Caliburger in Pasadena, there are many examples just in the past 18 months of robots successfully performing repetitive or mundane tasks in a variety of industries. Robots are quickly expanding in the food industry mostly in China and Japan, but also here in California. The robot restaurants in China have replaced greeters, waiters and some cooks. They are growing more popular, even if only as a curiosity for visitors to experience being served by robot waiters. For a number of years robots have largely worked in industrial capacities, bolted to an assembly line. Industrial robots are automated, programmable and capable of welding, painting, product inspection and testing, all with precision, consistency and speed. A study by MIT economists found that robots were responsible for the loss of up to 670,000 manufacturing jobs between 1990 and 2007 in the U.S.
Amazon and Walmart employ hundreds of thousands of machines within their warehouses and fulfillment centers that do much of the heavy lifting of goods, and filling and organizing shelves with the help of directing human workers. The warehouse robots have replaced some humans and the growth of Amazon has created thousands of new human labor positions, but the massive growth of e-commerce including the numbers of new warehouse hires do not mitigate the overall retail jobs losses that have been the consequence of this growth. Sea Change in the Use of Robots? 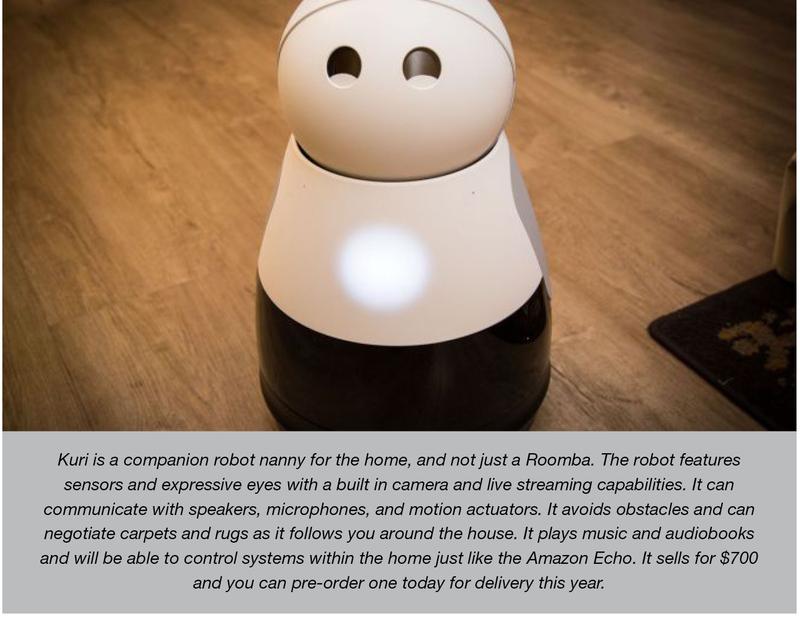 Now, a new generation of robots is here, capable of moving among people and therefore finding a wider range of work in stores, hospitals, hotels, and offices. And this has become a major cause of concern because the McKinsey Global Institute reported that 30 percent of the global workforce could be displaced by robots by 2030. While robots employed now are not displacing too many workers, they will in the future as they become more dexterous and smarter, and as human workers performing repetitive tasks become too expensive. Robots don’t need to be paid the minimum wage (or any wage at all) and they don’t need healthcare, family leave, sick leave, “a change in perspective,” vacations, or worker’s compensation insurance. There would likely not be massive unemployment because millions of new jobs would ultimately be created. Robots need repairmen, software programmers, circuit board designers, ergonomic specialists, etc. Consequently, robots do pose a disruptive force that will push us to seriously reevaluate our occupational training and skill set more carefully than ever. This is a good thing because when human jobs are eliminated much of this can take place mainly through attrition, particularly as the baby boomer industry continues to progress into retirement. Wages are now rising more rapidly in the fully employed economy, and this trend is likely to reverse as automation increases. Consequently, it is more important than ever before in human history to own skills that are deemed necessary for a rapidly evolving techno-economy. Furthermore, companies must adopt coming trends in AI that can create competitive advantage and generate value. This is what Amazon has successfully done, (and not without major criticism for being one of the early and successful pioneers). At a minimum, you can at least own assets that will rise in value as a result of AI growth. To me, this means owning shares of companies like IRobot, Nvidia, Google, Bosch, Ekso Bionics, Northrop Grumman, Honda, Boston Dynamics or Waymo. There are many others so now is a good time to conduct your own research.